continuing the christmas card theme with a monochrome style card. Square 8x8 white card as base, black card cut to fit part of card and embossed with papermania embossing folder. Black ribbon and Memory Box snowflakes with gems to embellish card..stamped sentiments.. Afternoon everyone..been havibg a little play and bought a plywood birdhouse decoration from the Range. i decorated with in my minds eye papers. distressed using tim holtz inks gathered twigs and sage green. memory box edge die to make roof decoration. flowers from wild orchid crafts. butterfly memory box die cut and sizzix swirls. well the kids finished school on tuesday and we have managed to fill our days for the first week already. Just two anniversary cards to share this week..the butterfly card was a masked stamping technique with a love sentiment stamp by papermania..the other card has a folk heart die cut with papermania heart backing paper. Well the weather has been stunning hasn't it? must admit a teeniest a bit too hot for me but coping with lots of ice cream!.. Well the school holidays are fast approaching and with that i have made the teacher thank you cards. My youngest finishes primary school this year and will start secondary in September and his year 6 teacher retires after many years at the school. so i have gone for CAS style cards using memory box butterfly to make an aperture in hammered card stock. backing papers chosen from DCWV and mounted on corresponding card colour. then mounted on A6 card. stamped sentiment from Hunkydory. can't believe it has been so long since last blogged!! main reason for absence has been major problem with my computer only working in safe mode for last 3 months. Luckily all fixed now ( fingers crossed)! Also busy with work and the boys..we have won lukes appeal for secondary school place yippee!! Anyway back with a LOTV card today - LOTV image dressing up coloured with marvy le plume pens. adorning squares spellbinders die used to cut image and background mat for LOTV sentiment..DCWV background paper..flowers and leaves to embellish with butterflies cut using memory box die. having to do extra shifts at work now a colleague has left. down side is less time to craft, up side is more money to spend on goodies ;). Well hope you are having a good weekend. Spent yesterday evening making a wedding card for my cousin. Dies used are memory box nottingham border, isabella and pippi butterflies and silverdale heart. 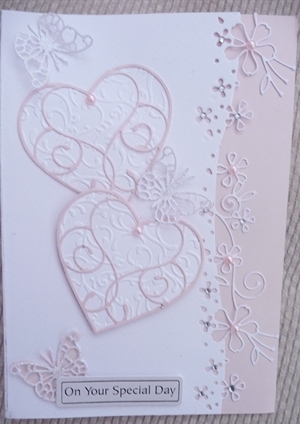 White cardstock and pale pink pearlescent cardstock used and embellished with pearls, glitter and clear gems..